When a news organisation deems it news-worthy that a country’s president would step down if not re-elected, the natural assumption of a reader might be that the situation had not always been so (and, in this case, that Hugo Chavez had at some early point suggested that he would not leave power in that event). However, the story was in fact based on a quote that Chavez directed to his opponents as he addressed the National Assembly: ‘If any of you win the elections I will be the first to recognise it, and I ask the same of you.’ We contacted the BBC complaints office to ask why this story had been represented in this way (view full email). The BBC complaints department asked us to regard the correspondence as ‘not for publication’, noting that we had published their response to our concerns about misleading headlines in December 2011. We were asked to ‘follow traditional journalistic convention’ and contact the BBC press office for a publishable comment. To date we have not had a response to this request from the press office. In the (unpublishable) response, however, the complaints department did stress that they have made ‘numerous references to how President Chavez has stood for – and won legitimately – several elections’ (though they failed to address the misrepresentation which was the basis for our complaint). We decided to look into this claim to see just how ‘numerous’ the BBC’s references to Chavez’s legitimate elections are, taking as a dataset all articles about Venezuela between the start of November 1997 (when the BBC website began) and the end of December 2011. This totalled 2,248 articles from the BBC website. Our objective was to research how regularly Hugo Chavez is referred to as a democratically elected president, and to compare this with how often words depicting the president as autocratic or dictatorial have been appeared (including direct quotes from opposition politicians/media). We found that, indeed, out of the full dataset, there were 146 articles (165 mentions in total within them) which referred to Hugo Chavez as either being elected or winning elections. 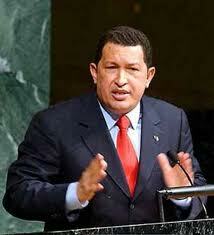 The word ‘legitimate’ has appeared only in direct quotes by Hugo Chavez himself. 27/05/2002 Profile: Pedro Carmona Mr Carmona initially attempted dialogue with Mr Chavez, whose authoritarian style and left-wing populism alarmed Venezuela’s traditional ruling classes. 06/12/2005 Venezuelans ‘lost faith in polls’ The US has in the past been a harsh critic of Mr Chavez’s autocratic style and he in turn has accused America of trying to assassinate him, BBC state department correspondent Jonathan Beale reports. 09/12/2005 Chavez to sit at Mercosur table Mercosur has clauses about democracy, and those who mistrust the authoritarian leanings of Mr Chavez would like him to sign up to these, our reporter adds. The graph below compares the number of articles describing Chavez as either ‘totalitarian’, ‘authoritarian’, a ‘dictator’, ‘tyrant’, or ‘autocrat’, with the number of articles that refer to ‘election wins’ or ‘elected’ (the words ‘landslide’ and ‘victory’ were also included). Given that one is verifiable fact and the other is speculation, the references are extremely disproportionate. What the archive shows is that BBC reporting has provided a consistent platform for political opposition to put forward claims (which history has proven to be unfounded) that Venezuela has been moving towards an authoritarian political system. Questions are repeatedly raised about the legitimacy of Venezuela’s democracy on the basis of quotes from Venezuelan citizens. To look closely at the sources of these quotes, one sees a selection which relies exclusively on the country’s business and political classes – in other words, a minority of Venezuelans. We took as our starting point all articles on the BBC website containing the word “Venezuela” (in the title or body text) between 1/11/1997 (the launch of the BBC news website) and 31/12/2011. This totalled 2,248 articles, some of which contained video or audo clips. No video or audio was included in this analysis, which is limited to text only. We have taken care to take all the results required for the study into account, however the data is subject to human error. Great work! Is this data accessible for any subject or person? If so I for one would be willing to help research how the BBC distorts the facts. Individual complaints are a complete waste of space, batted off by some minion with platitudes. If we could mount a campaign, for example, on distortion of Scottish issues eg referendum we might just make a difference.